Don’t let debt repayment overshadow taking care of yourself. Health and wellness is so. important to me, y'all. As I mentioned in my About Me, I once lectured a friend of mine about not having health insurance (which he can afford) at 3AM at his own party. One reason I started this blog: people come here looking for advice, unlike my friend, who just wanted to host a blanket fort party (shout-out to awesome friends who completely transform their houses into blanket forts and host grownup pajama parties complete with spiked Capri Sun, Gushers and pizza rolls. That’s #adulting, amirite?). He wasn’t asking to hear a long, drawn-out spiel on how EVERYONE SHOULD SEE A DERMATOLOGIST ANNUALLY (which you should), but there we were, sitting in a pile of blankets, with me pontificating on how you could have a cancerous mole on your head and why would you forego the chance to learn that information early?, and him wishing he’d bounced everyone, or at least me, out at 2AM so he could be sleeping in peace. When you stop taking care of yourself because you are throwing every extra penny towards debt. At first I laughed, because that llama is lookin a hot mess and it’s hilarious. But almost immediately, I thought NO NO NO. That is not what financial freedom is about, and neither should be the journey to get there. Another blogger mentioned that “frugality” has a public image problem because most bloggers don’t make living a frugal life seem like very much fun at all, if not straight up miserable and unhealthy, and this meme kind of encapsulated that idea to me. 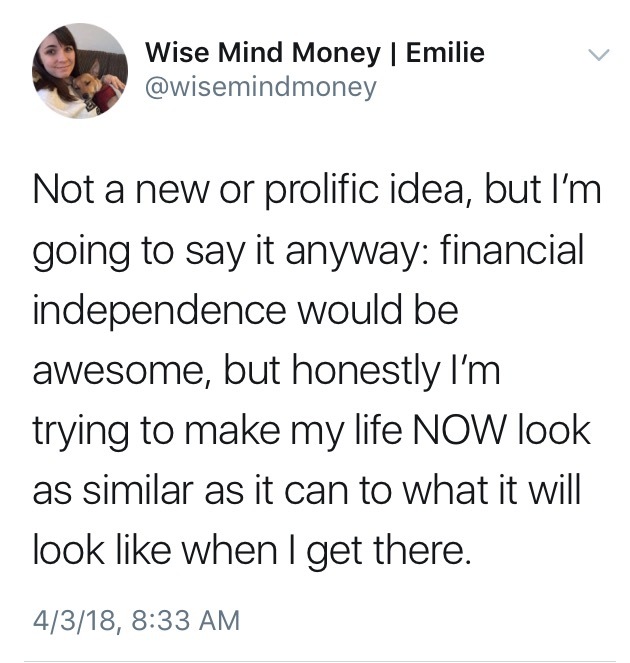 Financial independence doesn't have to be the end-all-be-all. She wants to live her life now as close to how she’d live her FI(RE) life, rather than giving up all comfort in pursuit of a long, long-term goal. And I agree. A life of deprivation (which is different than smart budgeting or eliminating waste) to get to FIRE is not a life worth living, at least for me. Might I live more luxuriously in the future? Sure. But I'm not sleeping on an inflatable mattress to become debt-free 14 days sooner than I would with a normal bed. Saving for the future and repaying debt shouldn’t cost you your present health and wellbeing. Somebody say it louder for the folks in the back! If we’re being cliché, Life is About the Journey, Not the Destination. Debt repayment is a long journey for many, including me, and if you are so laser-focused on Debt Free Arrival that you neglect your present self, it’s very likely you’re either going to arrive at the end so ragged and haggard that you can’t even enjoy yourself because you have to now rebuild yourself, or you’re going to burn out and fail to arrive at all (and still have to rebuild yourself). Everyone’s debt-to-income ratio is different, and I completely understand that some people may be so far in debt and/or with so little income, much less extra income, that they weren’t really able to prioritize their and their families' wellbeing before starting their journey to financial freedom, much less now that they’re trying to recalibrate their budgets to dig themselves out of a hole. Getting by and creating breathing room may currently be the goal. If that’s you, do the best you can, and check out some of these resources on increasing your income, intense budgeting, etc. : Poorer Than You (@stephonee), Tread Lightly, Retire Early (@TreadLightly_RE) and her AWESOME guide to Women in Personal Finance, catherineelizabethgordon.com (@CathElizGordon), The Financial Freedom Project (@FinFreedomProj), and finally, Mr. Money Mustache (@mrmoneymustache). There are many awesome ones, but these are some to get you started. Give up nights out to dinner with friends? Sure. Give up fresh fruits and veggies to save extra on your grocery bills? HELL NO. Give up expensive manicures and pedicures for awhile? Go for it. Not buying a $5-10 bottle of nail polish and giving yourself manicures even though you feel super fresh with bright pink nails because you think that $10 would be better spent on debt? HELL NO AGAIN. Foregoing exercise because that time could be better used sidehustling? Check yourself before you (literally) wreck yourself. Seriously. I’ve seen so many people in the past few weeks take pride in not spending all of their budgeted money on various categories because they then can throw that at their debt. Whatever your financial goals, spending is not a race to the bottom. People who budget in categories, those categories exist for a reason. It’s to allow you to make progress on your goals without feeling guilty for spending allocated money on allocated items. If you’re trying to reach FIRE, calculating every purchase you make against your FIRE date is going to make you insane. Yes, every penny you spend instead of save technically delays your financial freedom, but if you saved every penny you earned, you’d be damn near starving and pretty disgusting after only a week. Whatever your financial goals, spending is not a race to the bottom. If you’re trying to reach FIRE, calculating every purchase you make against your FIRE date is going to make you insane. You have to spend money to live. And I am here to reassure you that spending smart is better than barely spending at all. Structure your budget in such a way that you are taking care of your physical and mental wellbeing. Don’t be afraid to spend money on things that matter. Your debt can wait; your health will not. In fact, keeping or getting yourself as healthy as possible is likely to pay priceless dividends in the future that you may not see as the health and wellness expenses flow out of your bank account today. Hope you guys are as excited as I am for this series! Have you ever gotten so wrapped up in your debt repayment or financial independence plans that you felt guilty for even necessary spending? Have you had negative health or personal outcomes that you feel weren’t worth the extra debt repayment? What are some ways you’ve found to combat that? Share in the comments!